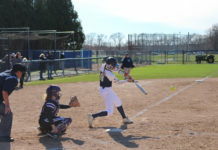 TheÂ University of Rhode Island softball teamÂ was swept in a doubleheader against La Salle University on Friday, falling by scores of 6-2 and 8-2. The Rams extended their losing streak to six Tuesday when they dropped another decision at the hands of Boston University, 7-4.Â The skid began with a 2-1 loss to Fairfield University on Thursday and a two-game sweep against George Mason University on Friday, losing 5-0 and 4-3. In the first game La SalleÂ jumped out to an early lead and never looked back,Â scoring in each of the first four innings including a three-run home run by Emily Moran in the bottom of the second inning.Â The only Rhode IslandÂ runÂ cameÂ off ofÂ a Stacey Fox home run.Â The loss was handedÂ to Caitlin Kennedy,Â who gave up six earned runs in four innings of work. In the second game of the doubleheader Rhode Island held a 2-0 lead from a two-run double in the top of the second inning by senior Marylynn Muldowney. 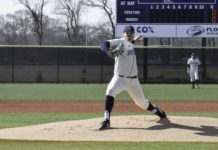 La Salle rallied back by scoring seven runs over the next three innings, and did not allow Rhode Island to score another run on the day.. Senior SamÂ Bedore (8-8) was handed the loss allowing eight earned runs in six innings of work,Â striking out nine and walking five. 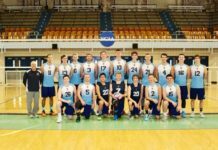 Following the doubleheaderÂ sweepÂ at La Salle the Rams looked to break their string of bad luck when theyÂ traveled to Boston UniversityÂ during the week. Boston University got out to a quick lead as four of their first six battersÂ scored in the bottom of the first inning. Rhode Island entered the top of the seventh facing a six-run deficit before making rally to close the score. Seniors Jocelyn Mattison and Amy Gleason started off the seventh with back-to-back doublesÂ and Mattison was able to scoreÂ off of Gleason’s hit.Â Gleason was driven in by an Olivia Hendricks’ single. Freshman Danielle Gariglio was hit by a pitch that put the potential tying run in the on-deck circle, before Stacey Fox reached base on a fielder’s choice with an error on the play allowing Hendricks to score.Â The rally was cut short after a groundout, though,Â andÂ the Terriers were able to escape with a win. KennedyÂ (2-12) was given the lossÂ againÂ after pitchingÂ 5.1 innings,Â striking outÂ two and allowing five earned runs. Cassie Baker also pitched 0.2 inningsÂ during whichÂ she allowed two hits. TheÂ team willÂ travel to face St. Bonaventure University in a doubleheader onÂ Saturday, followed by a trip to AmherstÂ for a two-game set againstÂ the University of MassachusettsÂ on Tuesday.